Marijampolės pieno konservai, UAB started to operate in 1977. Since 2001 it became a private company. This is one of the largest and highest performing milk processors in Lithuania, implementing newest technologies and aming for the highest quality of the products. We are the only canned milk producer in Baltic region. 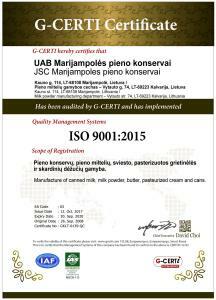 The production is carried out in accordance with the requirements of certified Food Safety (HACCP), Quality Management and Environmental Management systems. 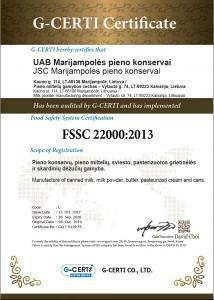 Certificates obtained: FSSC 22000, ISO 22000, ISO 9001 and ISO 14001. 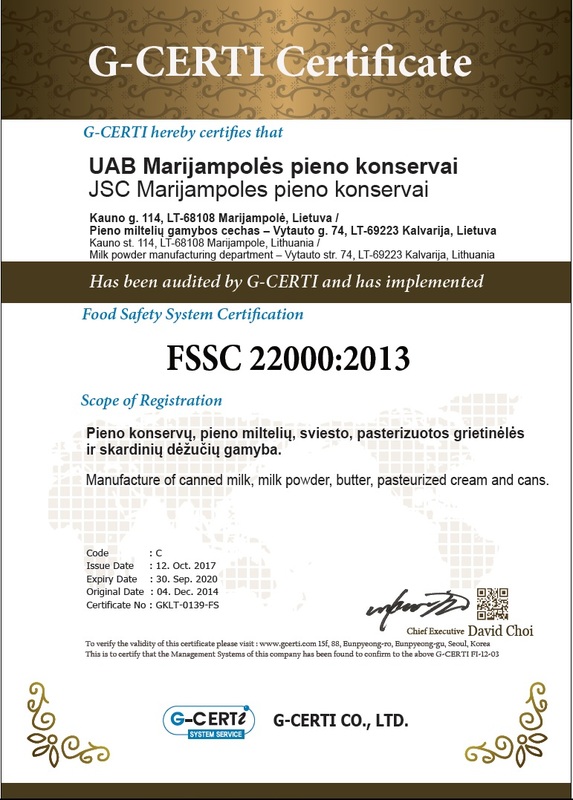 Marijampolės pieno konservai, UAB carries out activities of a socially responsible company, which was positively assessed during the social responsibility and ethics business audit. From June 2017 joined the ranks of the international nonprofit organization SEDEX. Today with 40 years of experience we are a trustworthy supplier for the partners abroad and valuable producer for the customers inside the country. 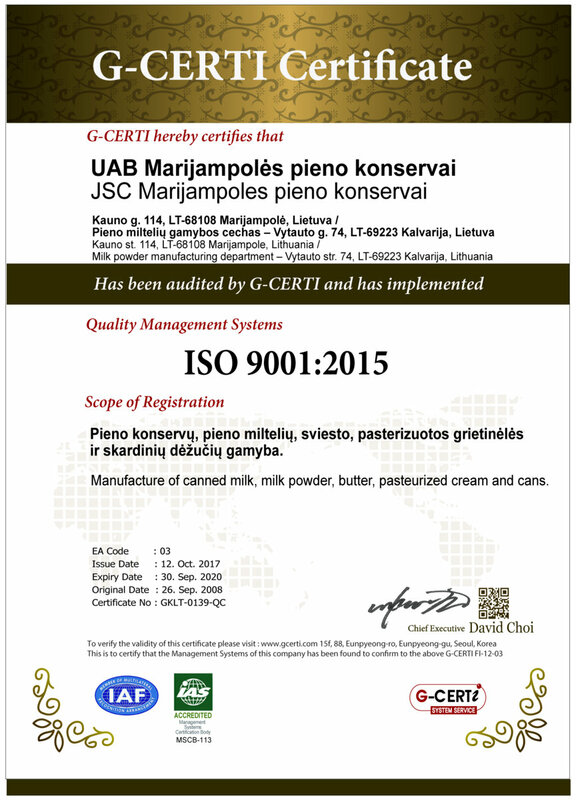 Marijampolės pieno konservai, UAB is one of the largest and highest performing milk processors in Lithuania. It is the only canned milk producer in Baltic region. The structure of the company’s processes ensures large scale production volumes. 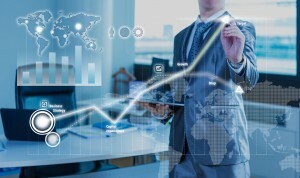 The technologies used by the company allow for ensuring that the quality of the products meet the legal requirements of Lithuania, European Union, Customs Union and other foreign countries. Natural raw milk used for manufacturing of the products is obtained from Lithuanian farmers. 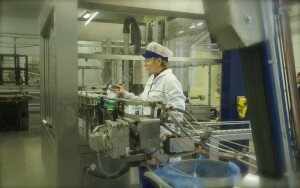 – pasteurized cream up to 3000 tonnes. Marijampolės pieno konservai, UAB is the biggest exporter among Lithuanian dairy manufacturers, however company is committed to further increase their export volumes. 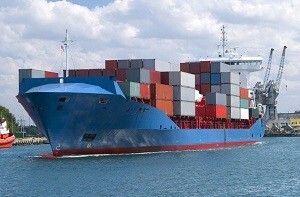 Number one priority for the company is export ant its development. Long shelf life of the main products (milk powder, canned milk, butter) enables conveniently transport them to any part of the world. Nearly 90% of the production is sold abroad. 10% of it ends up in CIS countries and the rest goes to European Union, African and Asian countries, USA, Cuba, Hong Kong and other remote corners of the world. We have accumulated invaluable experience in the export field, so we will definetily be able to give a proposal that suits you. All of the products produced by MARIJAMPOLĖS PIENO KONSERVAI, UAB meet the legal requirements of Lithuania, European Union, Customs Union and other foreign countries. Other specific dietary needs of customers (Halal, Kosher, etc.) are successfully fulfilled as well. The company has implemented an Integrated management system, consisting of Food safety (HACCP), Quality and Environmental management system, which have been confirmed by certificates since 2005. Product safety assurance activities are carried out in accordance with standards FSSC 22000, ISO 22000, quality assurance – ISO 9001. In order to minimize the impact on the environment, the company operates in accordance with ISO 14001. 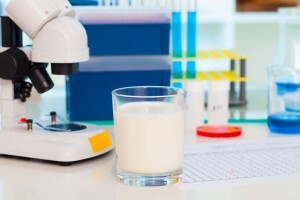 The company has two certified laboratories, which perform tests of the raw material, technology, processes and finished products for microbiological, chemical, physical and sensory evaluation. They also take control of sanitary and hygiene conditions. Both laboratories successfully participate in proficiency testing programs, taking part in interlaboratory comparison tests. Staff of the quality department and laboratory improve their skills annually by participating in training courses in Lithuanian and international forums.